Can you believe 11 years have passed since that fateful day? Like so many others I still cry when I watch memorials on television or read newspaper articles about the victims and the loved ones they left behind. It was only last year when it really hit me how much time has passed since that tragic day. Every year at my school we honor the victims of 9/11 in a special ceremony in the auditorium. Afterwards my students and I would have a discussion about 9/11. They were always eager to share their own stories of 9/11 with the class. Most had personal stories to share and knew someone who was there the day the towers crumbled. However last year while standing in front of my fifth grade class I realized that none of those children were alive during 9/11. September 11th would be a story that they were told, not an event they lived through. Similar to my grandparents retelling stories of Pearl Harbor. This realization made me wonder. Will they ever be able to appreciate the events of that day? Will they ever really understand how scared we all were? Will they ever know how we banded together as a city and a country? I don’t really know the answers but I began to understand my role and how important it is to make sure that I continue to talk about 9/11 with my students. I want them to remember and honor the victims of that day. I want to teach them to always remember and never forget. Since I am a teacher naturally I love books, so I was thrilled when I came across The Man Who Walked Between the Towers by Mordicai Gerstein. Every year I share this wonderful story about an amazing French street performer named Phillippe Petit. In 1974 when the towers weren’t quite yet complete Phillippe performed a daring high wire act. In the middle of the night dressed as a construction worker Phillippe snuck to the top of the south tower while his friends were making their way up the north tower. They strung a cable between the towers and Phillippe performed the most amazing tight wire performance of his life for the gawking New Yorkers below. The book is so well written and has the most breathtaking illustrations. 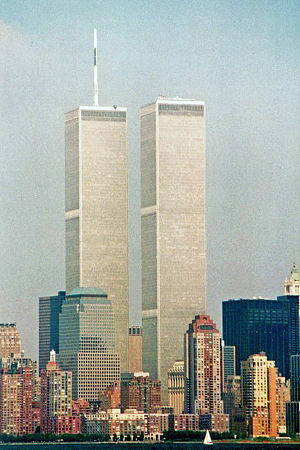 It helps the children understand what iconic structures the Twin Towers were. But, what I love so much about the book is that it is a celebration of the towers and their history. The story is uplifting and serves as a beautiful memorial to the towers and lives associated with them. This entry was posted in Back to School, Community, Life and tagged Casualties of the September 11 attacks, Incidents, Man Who Walked Between the Towers, Mordicai Gerstein, Philippe Petit, September 11 attacks, teaching about 9/11, Terrorism, World Trade Center. Bookmark the permalink.